Here at the Lost and Tired house, we have an ever increasing dilemma. That dilemma revolves around things like holiday’s, parties and most recently, trick or treat. 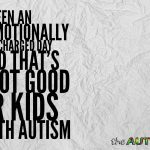 As a parent to 3 boys, in different places on the Autism Spectrum, the line between doing what’s best or just letting them be kids is getting blurrier all the time. 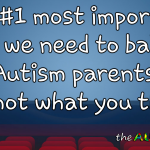 In speaking with many parents of children on the spectrum, I know that I’m not alone in this struggle. Right now, my biggest dilemma revolves around my oldest, Gavin. Elliott and Emmett, while on the spectrum, are better adept at handling these types of situations. That doesn’t mean we don’t deal with overstimulation and meltdowns for the next few days. However, that becomes more of an issue that affects Lizze and I and not so much Elliott and Emmett..if that makes sense. Gavin on the other hand is a very different story. Gavin is not like other kids, even those on the spectrum. Gavin not only has Autism and all the sensory issues associated with that but he also suffers from schizoaffective disorder and a yet to be diagnosed degenerative neurological disorder. 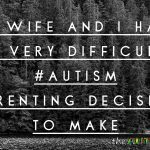 These conditions greatly impact his life in ways that Autism alone doesn’t. Schizoaffective disorder is basically a combination of Bipolar disorder and Schizophrenia. As part of the Schioaffective disorder, Gavin experiences audio and visual hallucinations as well as the mood cycling and everything else that goes along with having Bipolar disorder. 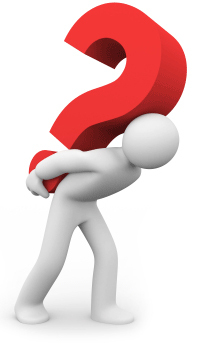 We have hit the end of the road with managing these challenges as far as medications are concerned. If the current medications he’s on fail to work, we have no other recourse as we have literally tried everything else. 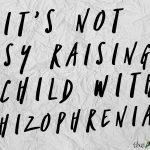 Kids with Schizo-type disorders are very difficult to keep stabilized. Anything and everything can cause them to decompensate. In Gavin’s case, this would prove disastrous. This is also something that can happen to kids on the Autism Spectrum as well, although for different reasons and to a lesser extent. When Gavin decompensates, he can’t tell what’s real and what isn’t. He sees and hears things that don’t actually exist. His visual hallucinations are often very dark and involve death or monsters. Saying that watching him decompensate and having to send him to the psychiatric unit is heartbreaking is like saying the Grand Canyon is just a ditch. Every single time we have to do this, a part of me dies on the inside. 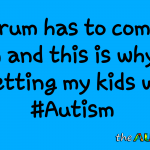 It’s tough enough just trying figure out what’s best for our 3 boys on the Autism Spectrum. 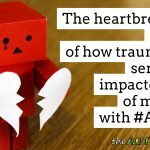 We have to worry about overstimulation and the subsequent meltdowns that are likely to follow, often times for days…. This is a very tough call for many parents, myself included and there is no clear cut right or wrong answer. On the other hand, despite the desire to avoid the likely fallout associated with overstimulation or in Gavin’s case, decompensation as well, there is the desire to just let them be kids. Traditionally, the Lost and Tired family has had to take different approaches for each of our very different children. Elliott and Emmett are easily overstimulated or overwhelmed but they don’t experience the same kinds of problems that Gavin can, and often will as a result of these types of exposures. With that said, there is so much that can be said about just letting them be kids. There is so much in their young lives that is out of their control. We are constantly working on speech or language skills, as well as addressing behavioral issues. At least one of the boys is in some sort of therapy every day of the week. The idea of them going trick or treating for example, as a parent, makes me feel really good. I want them to have these experiences. While it’s important that we have all of the therapies and avoid problematic situations, having fun is something my kids deserve to have. It’s a bit of normalcy that we, at the Lost and Tired house, so desperately crave. Having fun and just being a kid, is as important to my little ones, as sunshine is to a newly sprouting seed. Sometimes the end, just doesn’t always justify the means. What I mean is that, sometimes trying to avoid what might may happen, can come at a pretty hefty cost to our children. In other words, while trying to protect them and honestly, ourselves, we can inadvertently rob them of their childhood. 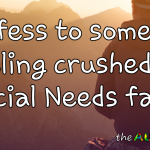 This whole thing, is really one of the most difficult things I face as a special needs parent. Trying to find balance is damn near impossible at times. 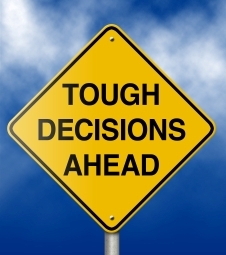 All we can do is weigh the pros and cons and make the best decision we can at the time. Sure we’re going to make mistakes or later wish we had made a different decision…but that’s life without an instruction manual. Having said all of the above, I’m faced with a decision that is not an easy one. This involves Gavin once again. As you are likely aware of, Gavin suffers from an exotic, degenerative neurological disorder. By exotic , I mean, that no one has ever seen a child with Gavin’s particular condition. Despite all of the leading experts we have seen, no one knows what to make of these problems. 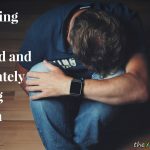 By degenerative neurological disorder (See:The CDD Journey), I’m referring to the condition that is causing Gavin to lose neurological and muscular function. For example, about 4 months ago we discovered that whatever is happening, has caused Gavin to lose all of his reflexes. His reflexes were intact as of January, 2011. We have also discovered that Gavin is losing the ability to move his tongue, causing problems with his speech as well as other things like eating. 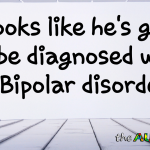 About the time we discovered the loss of reflexes, we also discovered that he does not have a functioning immune system and now requires monthly antibody infusions (See: Antibody Infusions). Despite all the exhaustive testing and visits to the Cleveland Clinic or Akron Children’s Hospital, we are left with more questions than we are answers. The most important question I have, that remains unanswered, is not what to call Gavin’s condition, but instead, will he survive it. That is my biggest question and at the same time, my greatest fear. We don’t know how progressive this is and if there is anything we can do to slow or stop said progression. This makes decisions about things as simple as whether or not we let Gavin go trick or treating, all that more difficult and complex. If we let him partake in things like this, the results could be disastrous, ending with Gavin having to be admitted to the psychiatric floor at Akron Children’s Hospital once again. However, and this is a big however, we don’t know how many more opportunities like this Gavin may have. At the rate these neurological and muscular issues have progressed this year alone, I don’t know if this time next year, he will even be able to walk. Do we try to keep him stabilized and out of the hospital at the risk of him never having the opportunity to go trick or treating or participate in any other situation that could be a destabilizing event? This question is something that is eating me alive and has become quite a heavy burden to carry. This is double edged situation if there ever was one and the very definition of damned if I do and damned if I don’t. There is no instruction manual for how to deal with these types of situations, nor is there an easy button to, well, make it easier. I have no idea what the right thing to do is. This, like many other things along our journey, has me completely lost….. If you would like to read more back story, you can start with these links: The CDD Journey, Antibody Infusions. hey rob… as always, you are a heroic writer. you bring me right to earth. you take no prisoners. i am so grateful for what you're doing here. do you feel like you've gotten enough 2nd opinions on Gavin? would it possible to travel to NYC to see someone at the NYU child study center or something? i don't know… just wondering if a fresh face would help. We have gotten countless opinions. The Cleveland Clinic is pretty much the best in the country. We were referred to Dr. Cohen at Akron Children\’s Hospital. He is considered the best in the world for this type of thing. He specializes in mitochondrial disorders, which is something we have yet to throughly explore. We are in the process of getting all the records, of which there are many, sent to him for review prior to our first appointment. We are unbelievably lucky to have him within a 30 min drive from our house.